Crossroads is a Web project that explores the capacity of film and advertising culture to shape our sense of place. 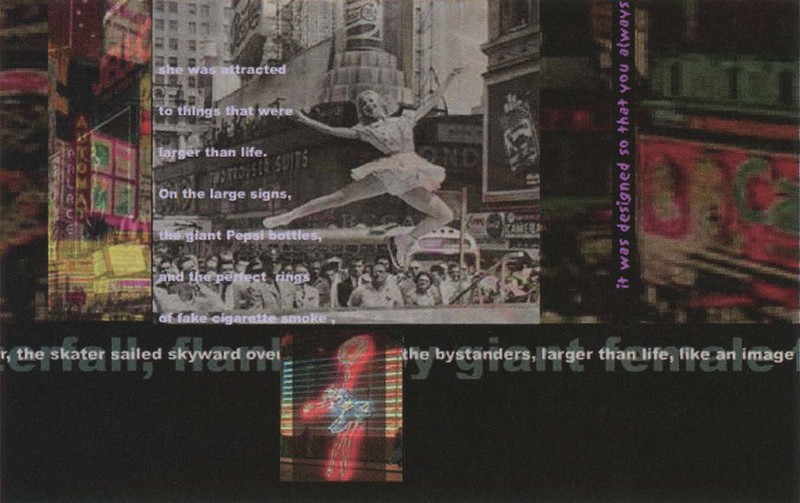 It creates a series of metaphorical spaces that are constructs of the mythic and actual Times Square/42nd Street area and extends to explore New York as a film location. The viewer can enter multiple narratives in the form of “pseudo films”: animated images and a mix of ambient sound, audio monologues, and animated texts. These “pseudo films” incorporate aspects of film genres that are closely identified with Times Square: noir, the B-movie, the musical, and the coming-to-New-York story. Crossroads establishes a dynamic space in which the familiar architectural and commercial icons of Times Square and 42nd Street are reconfigured in a mix of personal myth and public space. Environment and architecture become the scrim for projections of memory and imagination. My work explores the urban environment and architecture as visual language. While my projects explore the visual vocabulary of architecture, there is also an underlying investigation of the cultural and social meanings of the architectural landscape. This work develops new narrative structures that incorporate simultaneous, multiple narratives in image, text, and audio within a constructed space.